Presstv reports that Latin America plans US dollar replacement. Leftist Latin American leaders have agreed on using a new intra-regional trading currency, dubbed as Sucre, instead of the US dollar. Bolivian President Evo Morales, who hosted leaders of the Bolivarian Alternative for Latin America and the Caribbean (ALBA), said that the "document is approved." During the seventh ALBA summit, the leaders agreed on the currency reform as well as approving plans to impose economic sanctions against the coup leaders in Honduras, AFP reported. The currency, Sucre, is named after Jose Antonio de Sucre who fought for Spain's independence alongside Venezuelan hero Simon Bolivar in the early 19th century. Sucre is scheduled to be rolled out in 2010 in a non-paper form. 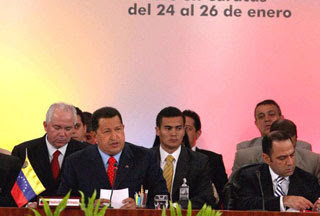 The nine members of ALBA, conceived by Venezuelan President Hugo Chavez, are Cuba, Dominica, Venezuela, Ecuador, Nicaragua, Honduras, Saint Vincent and Antigua, Bolivia and Barbuda. Wallstreetpit.com reports about U.S. Hyperinflation? Peter Bernholz (Professor Economics in Basel) studied the world's 12 most important periods of hyperinflation and discovered that the tipping point occurs when deficits amounted to 40% of the expenditures. For the United States we have arrived at exactly that point. The deficit of $1.5 trillion amounts to 41.7% of the $3.6 trillion in expenses. You see, that Peter Bernholz rounds some numbers, but for those of you keeping score at home, the real point is that the US deficits are greater than 40% of expenditures... And you know me, I truly believe in this history repeating itself. The point I'm trying to make here is that according to Mr. Bernholz, we can soon expect a bout of hyperinflation! OH BOY! Where do I sign up for that? Not only do we have a falling dollar causing us to lose purchasing power, but what purchasing power we have left is going to be eaten away with inflation! Like I said, OH BOY! Gee Willikers, that sounds like the cat's meow! NOT! So... Here we go again, with me getting on the soapbox and telling you that the only way to protect yourself from a falling dollar and hyperinflation is to diversify with non-dollar currencies and precious metals. The New York Times reports that Einhorn Goes for Gold, Slamming U.S. Policies. David Einhorn has a bone to pick with the Obama administration. The hedge fund manager, who warned about Lehman Brothers' precarious finances before it collapsed, said on Monday that he's betting on rising interest rates and holding gold as a hedge for what he described as unsound U.S. policies, according to press reports. Speaking at the at the fifth Annual Value Investing Congress in New York, Mr. Einhorn reportedly likened Treasury Secretary Timothy Geithner's regulatory reform plan to trying to stop terrorism by "frisking grandma and taking away everyone's shampoo." "If monetary and fiscal policies go awry," as Mr. Einhorn apparently believes they might, investors should buy physical gold and gold stocks, he said. "Gold does well when monetary and fiscal policies are poor, and does poorly when they are sensible." "Over the last couple of years, we have adopted a policy of private profits and socialized risks - you are transferring many private obligations onto the national ledger," the chief of $5 billion hedge fund Greenlight Capital said. "Although our leaders ought to be making some serious choices, they appear too trapped in the short term and special interests to make them," Mr. Einhorn said. According to a joint analysis by the Center on Budget and Policy Priorities, the Committee for Economic Development and the Concord Coalition, the projected United St ates budget deficit between 2004 and 2013 could grow from $1.4 trillion to $5 trillion. Last week when Federal Reserve Chairman Ben Bernanke, Mr. Geithner and White House economic adviser Larry Summers spoke in interviews and on panel discussions, Mr. Einhorn said, "My instinct was to want to short the dollar but then I looked at other major currencies - euro, yen and British pound - and they might be worse." My reaction: Confidence in the dollar is under attack. 1) Latin America is planning a US dollar replacement. 2) The US budget deficit in 2009 exceeded 40% of the federal expenditures, the historically tipping point into hyperinflation. 3) Big investors, including Mr. Einhorn, are turning to gold as a more attractive alternative to cash. This entry was posted in Currency_Collapse, Gold, News_Developments. Bookmark the permalink. stock market seems extremely overbought. I really think it should go down from here. when stock market crash, dolar usually will go up. will it be different this time Eric? Well, well, well, looks like the Dollar is in tight spot; short term condition - unstable, long term diagnosis - terminal. The situation is even worse for GBP. It will probably be the first major currency to collapse. But lately GBP is doing fine.. it just go up from 1.57 to now 1.65.
anybody who short the GBP is getting burned..
i wonder which is worse, dollar or pound?? It would seem the paradigm is heading for a major shift. Another surprise today: stocks down, dollar down. Play Poker ? Get Free Capital for training.